on creating a global ethical framework. The Global Peace Foundation’s signature vision of One Family under God has heightened relevance as a response to the growing threat of regional, religious and identity-based conflicts. Since 2009 the GlobalPeace Foundation has been promoting this ideal through convenings of global and local religious, political, academic and other civil society leaders, and through grassroots development and peace programs. speaking at the recent roundtable discussions. Opening up the discussions, moderator Dr. Markandey Rai, Senior Advisor of UN Habitat, stressed the importance of a global commonality, a concept emphasized around the world by ancient cultures and, increasingly, local governments and nongovernmental organizations. Dr. Rai expressed confidence in the Global Peace Foundation and United Nations to lead efforts in the development of a global framework based on ethical values and interfaith principles. “It is time for action, a need for sustainable development and growth,” Dr. Rai concluded. Global Peace Foundation International President James P. Flynn stressed the importance of addressing identity-based conflicts as one of the root causes of religious warfare. “The concept of Vasudhaiva Kutumbakam . . . and One Family under God shouldn’t remain lip service or slogans but have to be actualized,” Flynn said. He added that an endorsement of a global ethical framework could help to correct misinformed judgments and promote progress toward the ideal of unity in diversity. From top to bottom: Prof. C.
Speakers also proposed methods of communicating the message of One Family under God. 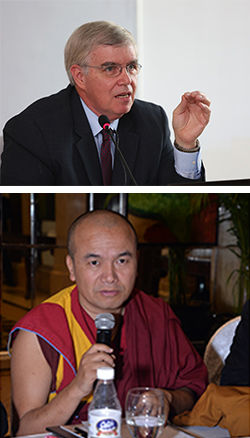 Geshe Dorji Damdul, Director of Tibet House in New Delhi, encouraged discussions with educators and administrators on how they could better guide students toward ideals of global ethics, morality and humanity apart from the regular curriculum. Dr. Laj Utreja, Formal Scientist of NASA and General Director of National Harmony/ Peace Academy, also emphasized the importance of transforming the educational school system. Echoing similar sentiments, Professor C. Raj Kumar, Vice Chancellor of O.P. Jindal Global University, explained how the University is deeply committed to global peacebuilding and giving access to high quality education. Manoj Choudhary, Former President of Delhi University Student Union, said the family is a school of love and ethical education, and that more importance should be placed on the family. “We as humans are curious beings and have been taught by what we saw and heard in our formative years. Human beings keep on learning from everything,” said Choudhary. Prof. Dr. Madan Mohan Verma, President of the Interfaith Foundation India, said that religion is not responsible for all of humanity’s ills and spiritual traditions are important in passing on universal values that can heal divisions. In concluding remarks, Global Peace Foundation India representative Dhruba Lamichhane reminded participants that structures of religion, culture, nation and tradition need to be preserved for our common humanity, for those suffering from starvation and other ills. He said people need to awaken, and open their eyes and hearts to these realities. 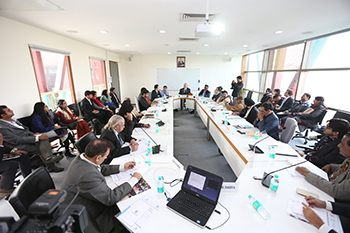 The rountable discussions were hosted by the Global Peace Foundation India in association with O.P. Jindal Global University. The One Family under God Campaign is a project of the Global Peace Foundation, currently helping to mitigate conflict in Nigeria. For more information and recent news visit One Family under God Campaign.